Addresses, Furniture, General, Manufacturer	1202 N 2nd St, A A CArlson, August 1926, book-cases, C J Swenson, inside front cover, library furniture, P. A. Peterson, Rockford Furniture Herald, Skandia Furniture Co.
Central Furniture Co., Located at the southeast end of water power; organized in 1878; capitol $125,000. Its present officers are: S.A. Johnson, President; J.R. Anderson, Vice-President; Aug. Peterson; Secretary and Treasurer. They are manufacturers of book-cases, desks and extension tables, and estimate their annual output at $150,000. They employ 140 hands, with an annual payroll of $75,000. The size of its factories are 40×100, 40×70, 86×102; four stories and 50×52, two stories high. 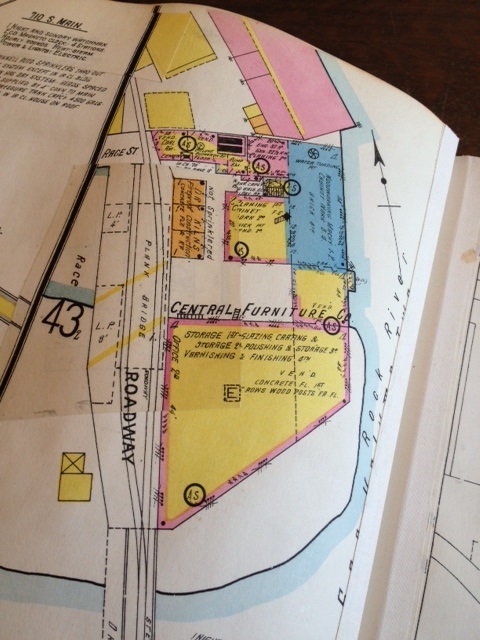 Above, Central Furniture Buildings shown on the 1928 Sanborn Fire Insurance Maps. Race St. is East-West street shown near the top of this picture, So. Kent Creek wraps around on the south end of the factory with Rock River on the East of factories. Address shown as Mill St. at Race St. in the 1928 Rockford City Directory. “Central Furniture Co., S. A. Johnson, pres’t. ; J. R. Anderson, vice-pres’t. ; August Peterson, secy and treasurer. Wholesale manufacturers of library furniture and writing cabinets. Mill St., and water power. Source: 1892 Philippi’s Rockford City Directory.